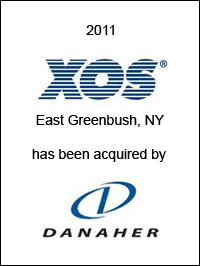 Danaher Corporation, Washington, DC, has acquired X-ray Optical Systems, Inc. (“XOS®”) based in East Greenbush, NY. XOS is a leading global provider of mission-critical materials-analysis equipment for industries and regulators that must control material quality and performance, from consumer products to electronics to petroleum industries. XOS leverages its world leadership in x-ray optics to supply application-specific analyzers that measure environmental and product contaminants such as lead, cadmium, chlorine, and sulfur. Danaher, with sales of over $16 billion, is a science and technology leader that designs, manufactures, and markets innovative products and services to professional, medical, industrial, and commercial customers. EC Mergers & Acquisitions acted as exclusive financial advisor to XOS on this transaction.